Kindness 3D Collaboration Poster. When complete, this poster says - "IN A WORLD WHERE YOU CAN BE ANYTHING BE KIND." The complete phrase is revealed as the viewer interacts with the agamograph poster by walking from one side of it to the other. This project is super easy for teachers and fun for kids. It's the perfect activity for your class during Kindness Week, Valentine's Day, Earth Day, or just about any time of the year. 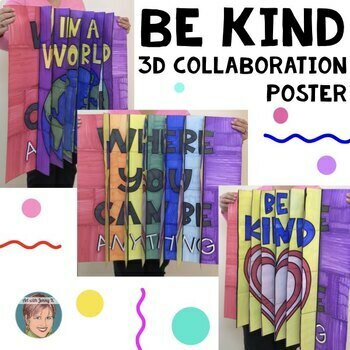 Promote kindness among your students and let them work together to create this one-of-a-kind 3D collaboration poster! This project is a “3-way” agamograph (3 images spliced together) and a collaboration poster all mixed into one. This project is completely unique because I dreamed it up myself. There is no beating the “wow” factor at the end when children walk from side to side and see the images change. Great for ANY age and designed so that younger students can enjoy the wow factor of my agamographs. 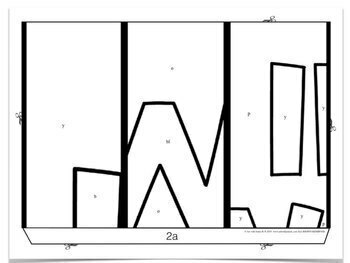 This 3-way agamograph may be hard to say - but I assure you it's easy to do! I know this may look like a hard project (that's the wow factor) but really it’s quite simple - I’ve done everything possible to make it that way. The kids do the coloring and you put it together - that’s it – I’ve done all the rest! I’ve broken it all down step-by-step AND I’ve made a video to show you exactly how to put it together. The final poster is approximately 26 inches x 28 inches when complete. You could use the final poster to display on your bulletin board, on a hallway wall or just about anywhere in your school. -Colored pencils, crayons or markers in red, orange, yellow, green, blue, light blue, purple, pink, and black. Although the process of lenticular printing is technical and very complicated, I have created kid-friendly agamograph designs that will result in a piece of artwork that won’t soon be forgotten! The images have already been “spliced” together and each space has been assigned a color. Once the pages are assembled students can walk from one side to the other side and watch the images change. 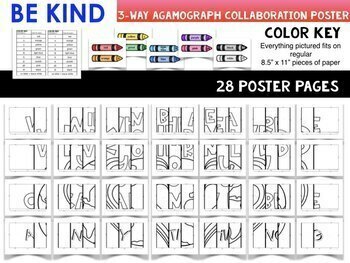 Jenny K’s 2-way Agamographs: I have created many “2-way”agamograph (2 images spliced together) projects for teachers to use in the classroom. In fact, I was the first to introduce this idea to Teachers Pay Teachers years ago. You may have used one of my other agamograph resources before (thank you!). If you have not and are interested in viewing those you can see all that I offer HERE. Jenny K’s Collaboration Posters: I believe in collaboration - teachers and students love creating my collaboration posters because of the large impact they have on their classroom community and their school wide community. I love that this new resource combines my agamographs and my collaboration posters together. You can see all of my historical collaboration portraits HERE and my seasonal and holiday related collaboration posters/door posters HERE. If you like my work please help me keep the price low by purchasing additional licenses for any teacher you would like to share this lesson with. Extra licenses are discounted. © Copyright 2019 Art with Jenny K. ® ALL RIGHTS RESERVED. Permission is granted to copy pages specifically designed for student or teacher use by original purchaser or licensee. The reproduction of any part of this product is strictly prohibited. Copying any part of this product and/or placing it on the Internet in any form (even a personal/classroom website) is strictly forbidden. Doing so is a violation of the Digital Millennium Copyright Act (DMCA).